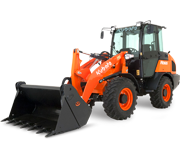 Kubota are the specialists in compact wheel loaders, specifically engineering the range to make material handling and loading jobs faster, safer and more precise, saving you time and money. Built to last, Kubota’s wheel loaders are made with quality components specifically designed to withstand tough Australian conditions. Taking on the toughest jobs in the tightest of spaces, Kubota wheel loaders are the versatile machinery solution for construction, industrial and agriculture applications.